A while ago we gave up our costly satellite TV service to spend more money on travel. I have mostly weaned myself from my FoodTV addiction but last week while cat sitting for a friend I saw Bobby Flay. He did a Vermont brunch featuring oven baked apples with oatmeal and maple syrup. I took his idea and made a small kitchen RV friendly version that I'm sure tastes just as good while being quick and easy. I use the quick Irish oats because they cook in 5 minutes instead of 20 for regular oats. If you are in a hurry or don't have a microwave in your RV you can chop the apples in small cubes, add the sugar mixture, and cook everything right in the pan with the oatmeal. The flavors won't be quite as distinct, but it'll still be delicious. The dollop of plain Greek Yogurt is important whichever way you make this dish. The slightly tart zing really makes a big difference next to the sweet maple syrup. Try it even if you are not a plain yogurt fan. I think you will be pleasantly surprised. Combine the brown sugar, salt and pepper in a small bowl. Cut off a thin slice of the bottom of each apple so they sit upright. Carefully cut the core and seeds out then put the apple in a microwave safe bowl. I use a melon baller to scoop out the core, but a narrow blade paring knife works too. Stuff the brown sugar mixture into the apple, pushing down with your fingers to get plenty into each apple then put a pat of butter on top of each apple. Add a splash of water to the bottom of the bowl then cover with plastic wrap. Microwave the apples 3-4 minutes or until just tender but not applesauce. While the apples are cooking make your favorite Irish oatmeal following the directions on the package, using real maple syrup as a sweetener. I like to use a smaller amount of water and then add milk just before taking it off the heat. You want the oatmeal to be fairly thick so it stays in the apple. 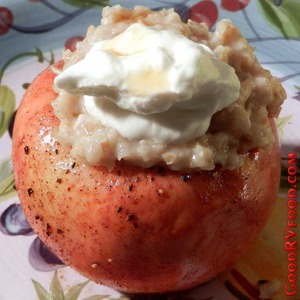 Put the oatmeal into the hole in each apple, top with a dollop of Greek yogurt and optionally drizzle with maple syrup. Alternate cooking method using stovetop only: Melt the butter in a medium size saucepan. Chop the apples (you can leave the skin on) into small chunks and sauté in the butter until they start to soften. Do not overcook or the apples will turn to mush by the time the oatmeal is done. Add the brown sugar mixture and stir to coat. Add the liquid ingredients you want to cook the oatmeal in, bring to a boil then add the oatmeal and cook for the desired amount of time. Add maple syrup, stir and put in bowls. Top with a dollup of plain Greek yogurt.